Typically Link’s adventures set him on a one-man quest to save the world from sin and darkness. One boy of humble origins receives a sacred sword and a commission from the gods of his generation to strike down evil forces. 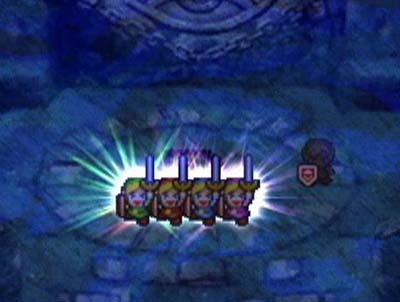 The Four Swords games give this idea a sort of twist; in order to achieve victory, the hero needs to use the power of teamwork by splitting himself into four individuals with the enchanted Four Sword. In this way the sub-series sets up a central theme of cooperation and the role and strength of community in maintaining peace in the world. The Four Sword is of course at the center, being the object that allows for the four Links to even exist, much less unite to battle evil monsters. The use of a number in the sword’s name already underlines the game’s focus on strength in numbers. While the idea doesn’t have its roots directly in canon, many fan interpretations of Four Swords give each of the multicolored Links different personalities based on particular emotions that they believe would be exemplified by their respective colors. This manifests in the game in a somewhat simpler form in that when playing with four players, each character can grab a different item and play with his or her own individual play-style. When players cooperate, they can more effectively defeat the monsters they encounter and solve the puzzles that block the way forward. Four Swords Adventures includes an option for single-play that displays this idea in a different form: the player can control all four Links simultaneously, allowing them to all act perfectly in tandem and assume various battle formations. The result is similar to multi-play in that the four Links can definitely achieve much greater feats than any of them could alone. It’s an extremely obvious theme: when we band together, we can accomplish so much more. The power of community shows itself in different forms in reality, but it’s just as prevalent. When we find ourselves in dire economic straits, people often band together to ensure that everyone’s needs are met. I’ve seen this in my own community when my church holds potluck dinners, when people donate old clothes so that those who have none can stay warm in the winter, and when social and professional networks lead people to job opportunities they would never have even heard of otherwise. Developing a resilient and functional community atmosphere is critical to ensuring prosperity for all in the good times and survival for all in the bad times. 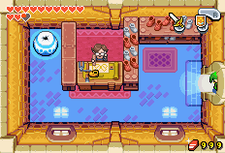 This image isn’t just limited to the Four Sword’s power to divide its wielder – it also shows itself in the Zelda universe in the form of the Minish tribe. In The Minish Cap, the Minish are constantly helping humans. The legendary Picori Sword is the result of an ancient Minish-human partnership to take down evil. A group in Hyrule Town assist Rem the shoemaker in completing the Pegasus Boots. We hear legends that the Minish are constantly putting items such as Rupees in tall grass and beneath rocks so that people can find them. That the Minish are so tiny and yet give so much to humankind represents the fact that our links to our communities are always present, even if we cannot perceive them. There are many other images of such teamwork throughout the game: the Gorons who work to burrow into the cave east of Hyrule Town, the Carpenters who with a little inspiration build new houses for the migrant Oracles, and of course the Four Elements that come together to form the Four Sword that can defeat Vaati. But perhaps the epitome of these is the Kinstone feature. 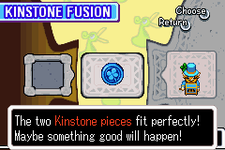 The Kinstones work by combining two compatible halves of a single coin in order to produce fortunate effects – the magic of good luck, it would seem. Kinstone fusion is a symbol of the results that giving our time, talents, and treasure can produce – both in the sense that they combine to form a solid whole and in the sense that they cause wondrous and even impossible things to happen. What we should take away from all this is that when it comes to our community, we shouldn’t hold back. They’re depending on us – just as we depend upon them. Everybody needs to contribute, to give their fair share. And who knows? If we do our part, maybe good things will happen for us.